There are various file sharing service available. People generally use Dropbox, Box, Google Drive and many other popular cloud storage services to share files. In this post, we are going to share an ultra simple file sharing service “File Dropper” which lets users share files up to 5 GB size. Advantages of this service is that it does not ask you to create an account. All you need to upload the file and then share the link with friends. 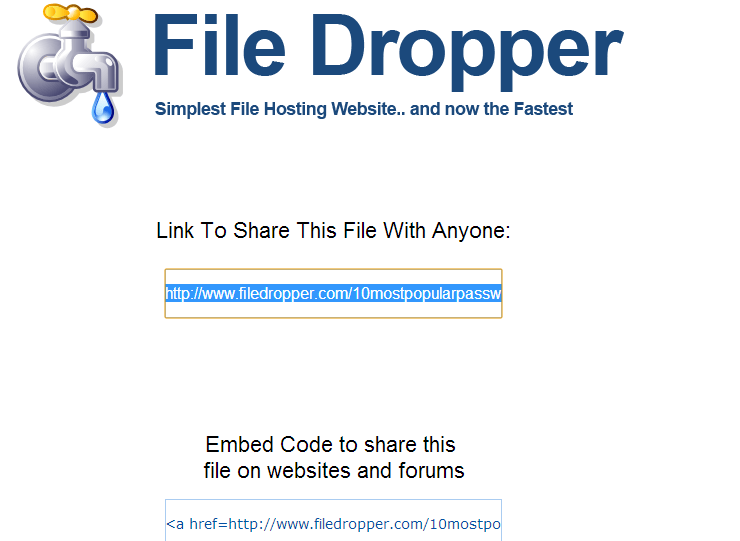 Visit File Dropper and upload your file. When you visit the website, you will see a big File Upload box at the bottom of the page. Surprisingly it does not support drag and drop support. Big progress bar will show you the upload progress. Once your file has been uploaded, it will redirect you to the new page with the URL to share the file. Here, you will get the direct link and embed link to share the file with friends. Now start sharing this file. When someone clicks on the link to download the file, it lets him download the file just by filling captcha on the download page. As the service is free, it also has few conditions for storing your file for long time on their server. If your link does not get any downloads for 30 days, it will delete your file from their server. Otherwise the file will be there on their server as long as it gets download. If you think that a file shared via File Dropper violates DMCA or other copyright agreement, you can also request File Dropper to remove the file from their server. You cannot add any kind of password protection in the files you are sharing. Any person having access to the link can download your file. 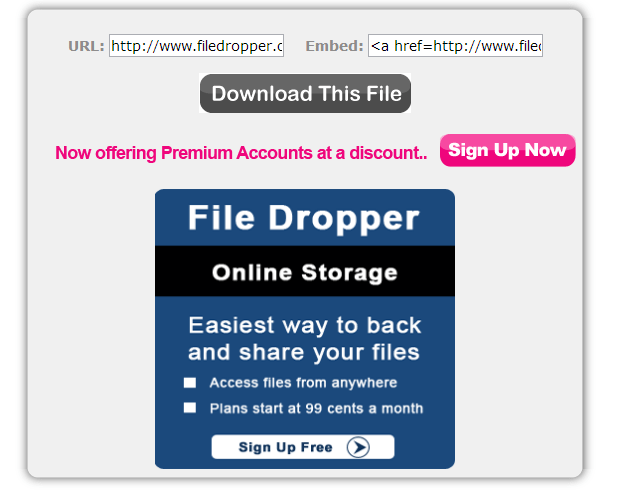 FileDropper is really a nice file sharing service. If you do not want to use your personal cloud storage account for sharing a file, you can use this to share files. Really simple to use and it only few mouse clicks to share a file.